In a galaxy far, far away, an old story was told in a new way: a hero journeys from adolescence into adulthood, tempted by the dark side, he ultimately chooses the light. His journey is instructive in innumerable ways. Throughout the saga, we learn that the struggle between light and darkness is a constant, and each of us has both, the Jedi and the Sith, within us. Therefore, ever day, we must choose which side to feed. 1. Do, for there’s no try. You don't "try" to build a business, pursue a job, buy a house, lose weight, get a college degree, or love someone. You do or you don't. Everything else is only an excuse and a reflection of your inner non-commitment; a lack of powerful, unequivocal decision. Trying can be elusively seductive, because it gives us a feeling of busyness, progress, and effort—it makes us feel good—but without going the distance. It also makes us feel safe, because trying isn't the same as committing. In other words, if we fail (and fail, we will) our ego is spared because we had not fully committed. We only tried. So, take it from Master Yoda, and do. Do a lot. Action will create motion and motion will deliver results. Fear is a disease. It lurks from the shadows, sabotaging our advances, and preventing the force, that is—life—to reveal itself in its full glory. It prevents you from competing for that dream job, from putting those words down on the paper and making it into a book, and from saying "I love you". And yes, it also prevents you from making a million dollars, traveling the world, and building a community you're proud of. 3. Let go of anything that no longer serves you. What's a definition of madness? Doing the same thing over and over again and expecting a different result. Everyone knows this. And, yet, most keep doing the same stuff over and over. 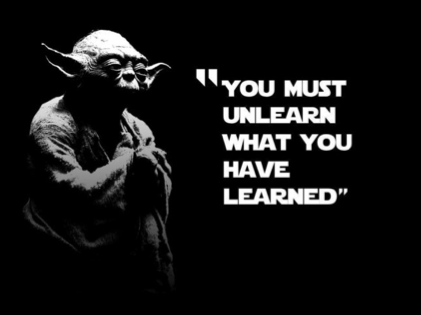 Because until we can unlearn a certain way of being and living, we cannot possibly learn new things. We will only understand once we have forgotten what we understood before. This is a process, and it can be difficult because we are letting go of a lot of old stuff that gave us meaning and identity; yet, it is essential if we want to obtain the things that can serve us better in the future. Luke Skywalker had to leave Tatooine in order to follow his bliss. Do you have the courage to do the same? 4. Don’t let "impossible" odds hold you back. What were the odds that an awkward college drop-out would build the most valuable company on Earth? Yet, Steve Jobs did it. What were the odds that a poor black woman from "the South" would become a queen of media? What were the odds that someone like Donald Trump would raise to the American Presidency. Odds are a statistic, and statistics are numbers, and numbers have as much value as we assign them. They're not the life, the force, that exists within you and makes anything possible. Don't follow the odds, follow your bliss. It is when we follow our bliss that the Force is the strongest. One last word on the Force: George Lucas drew his hero's journey narrative from the writings of Joseph Campbell, a legendary mythologist, who understood life better than most. It is life—that force within each of us—that, when in balance, allows us to recognize that the stars are within us as much as they're outside of us. From chance meetings and transformative experiences to a strike of a genius, when we pay attention to what is within us, the universe of possibility revels itself. You're the hero of your own story. You've got the life within you. Make it count.